And if you’re going to go with a naked wedding cake for your reception just make sure it has a lot of icing inside. Then I’ll be OK with it. Or, make sure it looks like today’s featured cake – simple yet stunning. 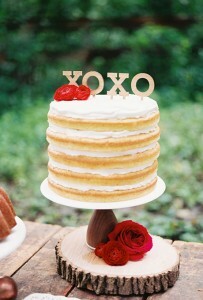 This naked wedding cake isn’t boring at all thanks in part to the lovely red roses and that fun wedding cake topper. I’d give this cake some x’s and o’s for sure. You can find this naked wedding cake here. It was created by The Faux Martha.